I bought these in packs of pairs and the pack has no performance data shown at all, not even the SNR. This is poor, very poor. The back of the pack also has no SNR performance data on it either. And yet again, come on manufacturers, you don’t need a little plastic bag for each pair of plugs - 3M manage to pack pairs of E-A-R Classics in little card pouches. 34dB of noise attenuation puts these at the higher end of the performance scale for an ear plug, with only a handful going a little higher. Beeswift aren’t very forthcoming on their website for the full APV performance data for the plugs, limiting it to the SNR and HML numbers, with the ‘data sheet’ being largely blank. A difference of 5dB between the lower and higher frequencies means these will distort the frequency range to some extent and there are much better, similarly priced, alternatives on the market. Not recommended. At 10p a pair, and cheaper if you buy in bulk of say 500 pairs at once, they are certainly cheap, but their fit and comfort (see the next section) is so dire they are anything but good value. The first comment to make about these plugs is that they are big. They are longer than the Moldex Spark or Leight Laser Lite plugs, which are themselves longer than the E-A-R Classic, and all of them have around the same SNR so similar levels of performance. This means the foam used in the B-Brand BBEP foam plug must be less effective than the foam used in the others as it takes more of it, with a longer route for the noise to pass through, to achieve similar results. As for how they fit. The first day I tried them on a noise assessment I wore them for about three hours and swore never, ever again. 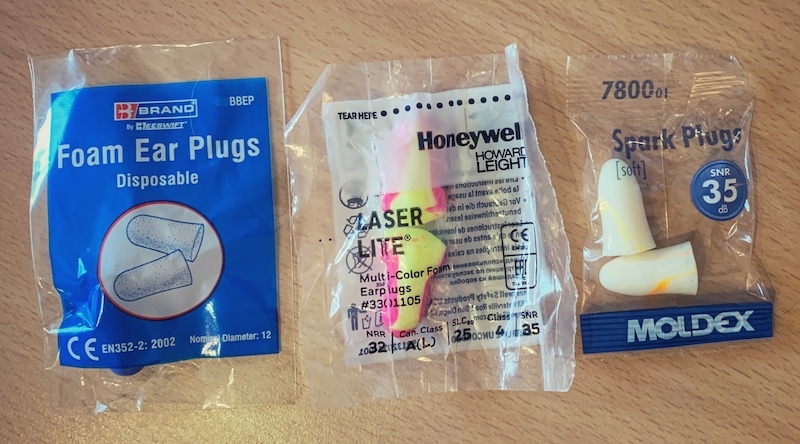 I generally don’t have a problem with foam ear plugs (see the reviews of the E-A-R Classic or Moldex Spark Plugs for example), but these were torture. To be sure it wasn’t just me on that particular day, over the last few days I have been working in Lincolnshire and staying in a busy hotel, so wore the BBEP B-Brand ear plugs for a night to help get a good night’s sleep. I put them in around 11pm and they hurt going in. I then awoke around 1pm with possibly the most severe pain in my ears I have ever experienced - it was like someone poking a hole in the ear drum with a match. Which was lit. Absolute agony. They form an incredibly tight seal so getting them out isn’t a case of just pulling them out or you’ll create suction pressure on the ear drum, so I gently eased them out until with blessed relief they were gone. I grabbed a pair of Moldex Spark Plugs, which are again foam plugs, rolled them, popped them in and was absolutely fine. The foam feels firmer than the foam in the Laser Lite or Spark Plugs and coupled with their slightly larger size means these things hurt, a lot. Not a chance in hell am I trying these on my motorbike with the added pressure on the ears of a helmet. ✘ Wearing while asleep? No. Frankly, I don’t care about the price, which is nothing special, as these things are absolutely bloody awful to use and wear. A hard foam and massive plug which was agony in use. I am never ever putting B-Brand BBEP foam ear plugs in my ears again. Awful things.